A decade ago, social media was young, mommy-blogging was a hot new trend, and — oh yes — the economy was falling apart. Millions of us lost our jobs. Now that the job market is strong again and unemployment is low, some of the hottest occupations are lines of work that either didn't exist or were little known back in the first decade of the century. Opportunities include photography and film, inspecting tall buildings, and mapping difficult-to-reach areas. Amazon is experimenting with package delivery by drone, while Facebook is experimenting with using drones to bring internet access to remote areas. With the expected growth in drone use, today's operators could also find work training and certifying tomorrow's operators. Growth expected by 2021: 1,000 percent. Requirements: FAA certification, possibly short training programs. Machine learning is basically another way of saying artificial intelligence, a field where the overall job openings have grown 450 percent since 2013, according to the 2017 Artificial Intelligence Index. This kind of engineer is a ninja programmer who is probably also a math whiz. But wait, you may say: Everyone knows that AI is going to destroy jobs, not create them. Not necessarily. Research and advisory company Gartner estimates that AI will create 2.3 million jobs by 2020, eclipsing the 1.8 million it's expected to eliminate. Growth since 2012: 980 percent. Requirements: BS or MS in computer science. This type of engineer analyzes data produced by websites, apps, computer sales systems, and more, answering business questions or finding trends. The word analytics is sometimes used interchangeably with data science to describe this work. Data scientists usually need to know a statistical programming language, such as Python, as well as a database querying language such as SQL. The roles of machine learning engineer and data scientist are closely linked; machine learning engineers on LinkedIn are likely to list data scientist as their previous job title, and "machine learning" is one of the top skills listed by data scientists. Growth since 2012: 650 percent. Requirements: BS, MS, or Ph.D. in statistics, computer science, math, or data science. Although jobs for college graduates have led the recovery since the recession, here's one that requires little education. This is the person installing the solar panels on your roof. This job is growing because the solar industry is hot, producing 24.5 percent growth in all solar-related jobs in 2016. Growth expected through 2026: 105 percent. Requirements: High school diploma, on-the-job training, possibly tech school courses. Ten years ago, the iPhone was new, and not everyone knew what an app was. Now almost 77 percent of Americans own a smartphone, and my 90-year-old grandma downloads a new slot machine app every week. Short training programs for app programmers have sprung up in San Francisco that turn out graduates in a year or less. These developers go on to make six figures and often get company equity at their first job. Growth expected through 2026: 31 percent. Requirements: BS in computer science or software engineering, or programming boot camp. There was such a job as genetic counselor 10 years ago, but people with that title today wouldn't recognize it as the same thing. In the past, genetic counseling consisted of interpreting just a few available tests and sharing the results with patients. Today, so much data is available on an individual's genetics that the job has a larger technical component. Part of the expansion of this job is driven by the growth in genetic testing kits available directly to the public. Growth expected through 2026: 29 percent. Requirements: MS in genetics or genetic counseling, board certification, state licensing. These brainiacs use advanced math and analytical methods to solve business and organization problems. There is some overlap between this job and data science. It's also so closely linked to the fields of analytics and data mining that some consider the words interchangeable. The upshot: If you know how to crunch numbers and get important insights out of huge amounts of data, you're going to be in demand, no matter what you call yourself. Growth expected through 2026: 27 percent. Requirements: BS or MS in business, operations research, math, analytics, or computer science. 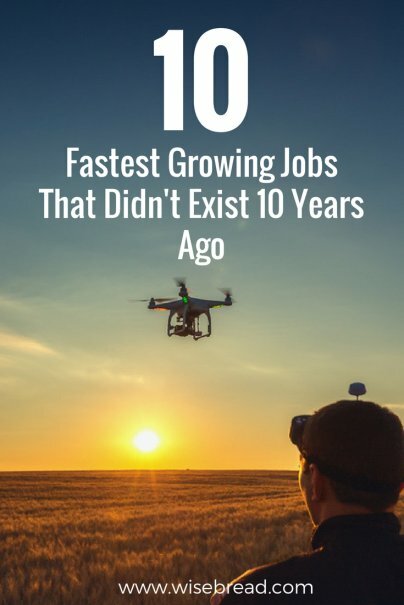 Like many jobs on the list, this field is driven by the ubiquity of high speed internet. Patients are increasingly given the option to video conference with a physician and get a diagnosis or referral to a specialist. Hospitals and medical groups are hiring more doctors comfortable with telemedicine, because the practice saves money and results in better access to specialists, less wait time, and less spread of disease from waiting room contact. Physicians who want to become telemedicine practitioners may need to learn to use connected versions of tools they already know, such as thermometers and stethoscopes. The Bureau of Labor Statistics predicts 13 percent growth for all physicians through 2026, and that includes tele-physicians. However, given how quickly telemedicine is growing, it's reasonable to assume that this niche will grow faster than doctor jobs as a whole. Growth expected through 2026: 13 percent or more. Requirements: MD, board certification, medical license. With the growth in online medical records, professionals who are well versed in medical coding for insurance claims and organizing and securing medical records are needed. Growth expected through 2026: 13 percent. Requirements: Tech school training program. Nearly every brand — from baked goods to airlines to government agencies — now hire specialists to represent them on social media platforms such as Facebook, Twitter, Snapchat, and others. These workers might create and post content, moderate discussions, collect and respond to customer feedback, and use analytics software to monitor the brand's image and activity across all social media platforms. The U.S. Bureau of Labor Statistics lumps social media specialists in with public relations workers, and rates job growth for the whole field at 9 percent. However, since social media continues to be a hot growth field, it's reasonable to assume that social media jobs are growing faster than other PR jobs. Growth expected by 2026: 9 percent or more. Requirements: BS in communications, public relations, journalism, or marketing.